Drinking summer beer is one of the most relaxing aspects of backyard barbeques. You can also cook with summer brews and fabulously enhance your cookout fare. Refreshing, flavorful beers make great marinades for meat or fish as well as delicious dipping sauces. 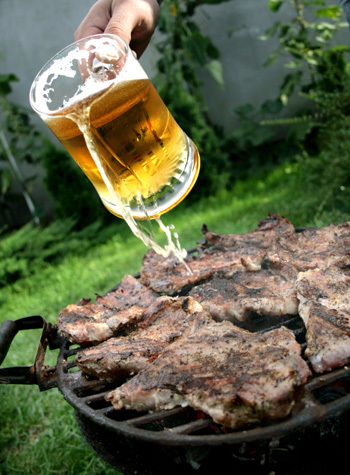 Cooking with beer is simple and will make your backyard meals even more fun. with shellfish, seafood and chicken. a pale ale, hefeweizen or pilsner. As a rule, less hoppy beers are best for summer dishes because hops can be overpowering. sauces or marinades, or in dishes that feature those particular flavors. 1. Mix flour with basil, salt and cayenne pepper. Pour in beer and whisk well. 2. Coat fish in batter and let excess batter drip off on a cooling rack set over paper towels. 3. Meanwhile, heat oil in a skillet over medium-high heat and add fish. Cook on both sides for about 4 to 5 minutes per side. 4. Remove fish from skillet with a slotted spoon and cut in half. Place 1 whole piece of fish in each tortilla and top with avocado slices. refrigerator for 10 to 15 minutes, flipping if necessary. 2. Take steaks out of liquid and place on grill. Cook about 7 minutes per side or until preferred degree of doneness. Let steaks rest for 5 minutes before serving. Combine all ingredients in a large bowl and mix well. Use as a sauce for ribs, burgers, steak or chicken.